This is the first screen you see when you load the SportsCad program. You have the ability to change the background picture and company name. The 1st 3 buttons on the left are what you will use in your day to day use of the software. 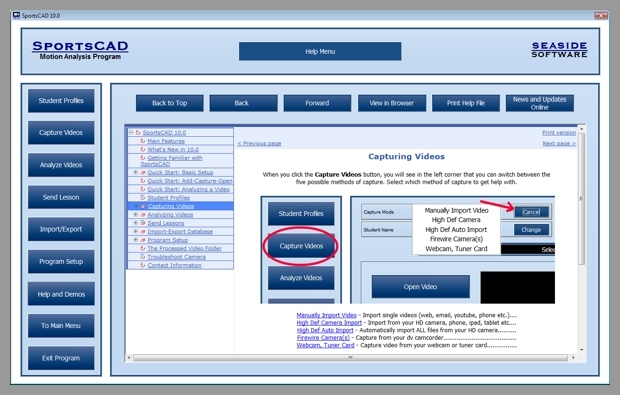 The "Student Profiles" section is where you can view, organize, and modify your library of videos. You can also keep detailed information on each individual student. The "Capture" section is where you will go to copy the video from your camera to the program. There are 5 different methods of video capture and import. The Analysis section is where you go to do the actual analysis of your videos. Here you will have countless tools to analyze and compare videos. 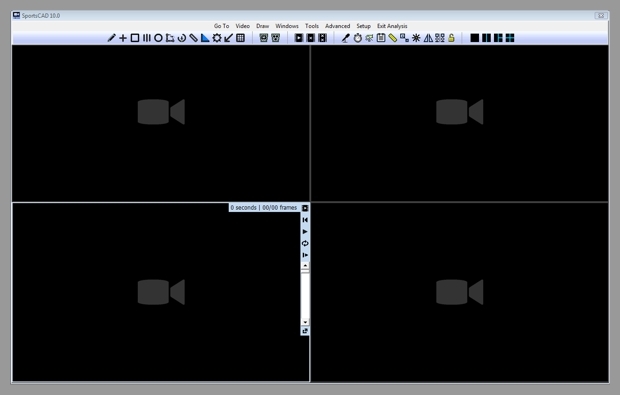 This image shows the Analysis section in 4 screen mode with the Menu bar dropped down. 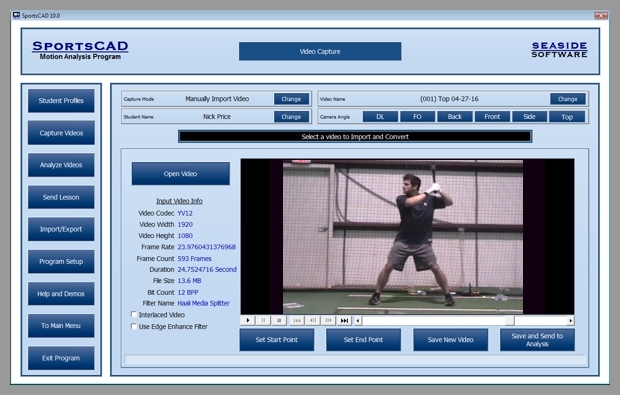 SportsCAD Platinum has 3 ways to send your lessons, video drills, and student videos. 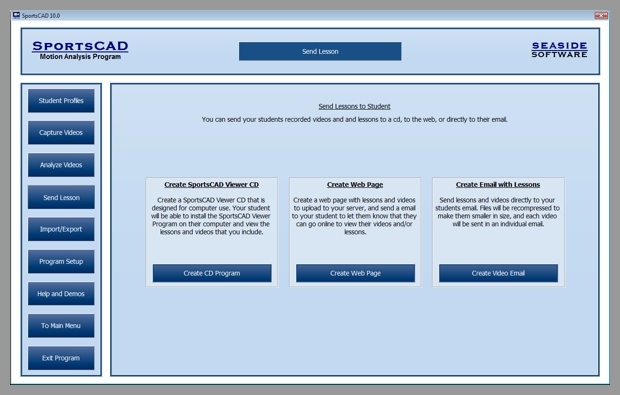 You can send your student home with a cd which has a Windows PC SportsCAD Viewer Program, you can email directly to the student, or you can upload to your website and your student can view them there. The Import-Export section will allow you to import or export complete Student databases to or from cd, flash drive, zip disk or external hard drive. 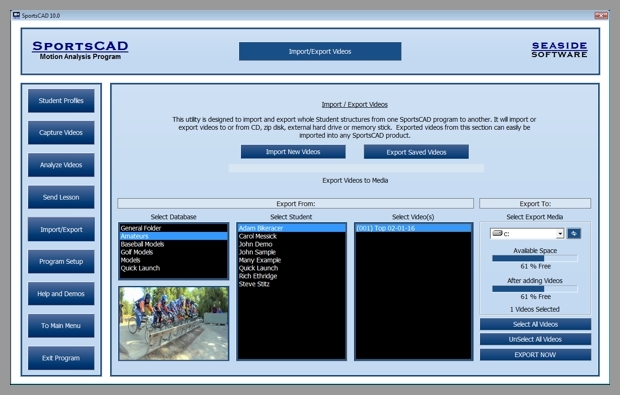 The exported databases can then be imported into any copy of SportsCAD for file sharing or backup purposes. 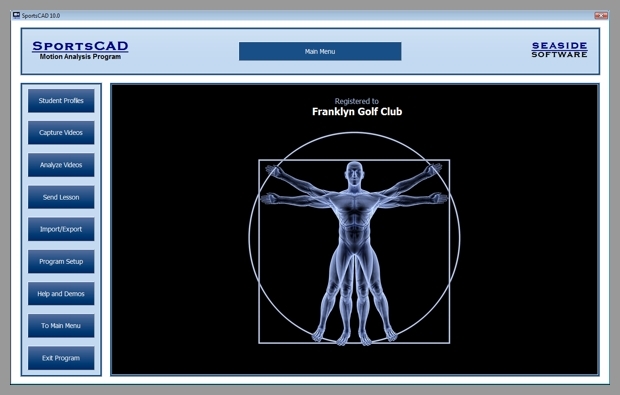 By clicking on the “Program Setup” tab, you will have the ability to customize SportsCAD to best suit your business. 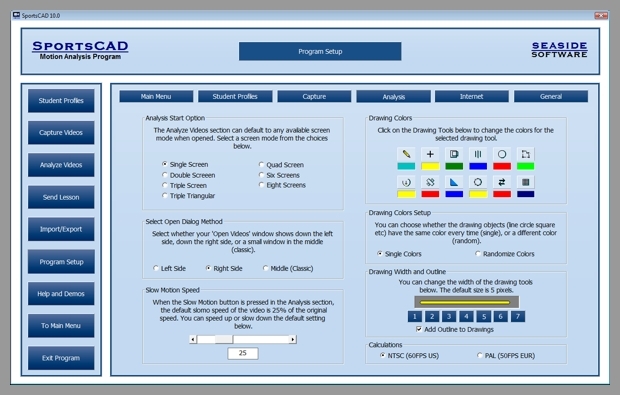 Here you have the ability to change pictures on the Main Menu, change the color of the entire program, change from Student to Golfer-Patient-Athlete-Client etc, edit information that you collect while creating the “Student Profile”, setup different capturing and naming methods, and set up your “Analysis” settings. By clicking on the “Help and Demos” tab, you will have the ability to find information that you are unfamiliar with with a click of the mouse. This section includes comprehensive instructions of how to operate SportsCAD. The analysis section displays full screen edge to edge video. When you move your mouse to the top, this "drop down bar" appears so that you can select from our wide variety of tools. Here is an example of the drawing tools. They include FreeHand Draw, Square, Line, Circle, Angle, Path, Parallelogram, Zone, Clock Grid and Arrow. You can also add a grid to the videos and change its size. Much more can be learned by viewing the demonstration videos.